Ingrown toenails can be extremely painful. They often occur as a result of the nail growing into the skin/flesh. The nail is essentially cutting into your skin. At first you may feel a slight tenderness but no redness or swelling. Then as the nail grows longer or there is trauma to the area (from shoe pressure or kicking the toe), it begins to press into the skin until it manages to cut the flesh. Sometimes, the nail has been cut incorrectly or has been torn off from trauma, leaving it too short at the corners or with rough edges. This can potentially lead to an ingrown toenail if left untreated. 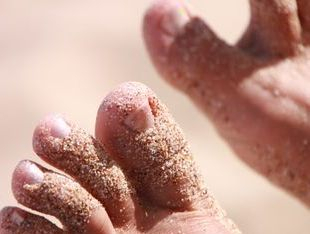 The most severe cases of ingrown toenails are often in people with poor circulation &/or sensation in their feet. These people sometimes cannot feel the nail cutting into the skin until infection develops. The wound also takes much longer to heal, leaving the area susceptible to further infection & in some cases, amputation. Podiatrists see ingrown toenails on a regular basis & are trained to reshape nails & removed the offending nail piece that has embedded itself into your flesh. We usually do this without the need of a local anaesthetic with minimal pain to the patient. However, we can administer an anaesthetic if the area is extremely difficult to manage. At Happifeet Podiatry, we can perform nail surgery if necessary. We use a technique that does not require any stitches (which minimises scarring) & in most cases take less than a month to fully heal. We do not recommend people to treat ingrown toenails themselves at home because of the risk of infection. If you leave a rough piece of nail behind, it will cut into the flesh again later when the nail grows forward or when there is pressure on it - e.g. from shoes. We use sterile instruments & podiatry techniques to help prevent the ingrown toenail from coming back.